GI (Investinženring d.o.o.) in it’s capacity of supervising engineer is providing technical, financial and contract management services to the Client “Hrvatske ceste”. The contract is based on FIDIC (Red Book). The project includes realization of 1A phase of the Highway section Virovitica-Suhopolje which encompasses main alignment from ch. 0+500 to the end in total length of 9.1km, field route crossings including three overpasses, junctions” Suhopolje jug” and “Virovitica jug” with all auxiliary structures, related utilities and infrastructure. Section starts with south branch of junction “Virovitica” with state road D5 in the proximity of village Brezik (in the North ) and Virovitica Sugar factory VIRO (in the south), stretching to Suhopolje almost parallel to the existing state Road D2. Section ends in the junction “Suhoplje” ( south branch of the junction) with the county road Ž-4005. 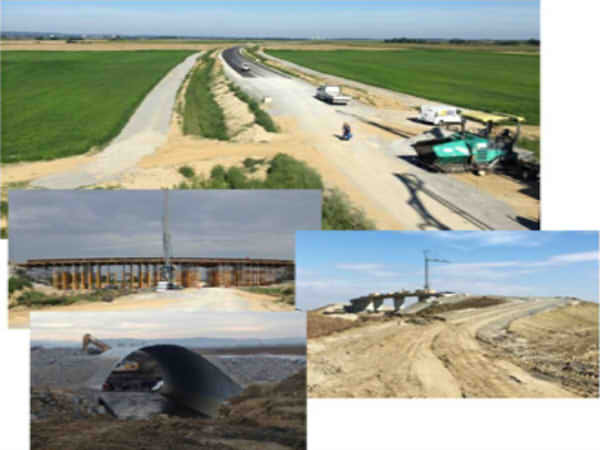 The Road, almost entirely constructed on fill crosses the field which is crosslinked with numerous irrigation channels thus resulting in construction of 55 culverts needed for proper functioning of the irrigation systems.